Venezuelan kidney-transplant patient Jesus Mendoza (right) in Cucuta, Colombia, displaying the meds he recently received as his kidney specialist wife, Dr. Maria Eugenia de Mendoza, looks on. Jesús is a kidney transplant patient. He has to procure his organ anti-rejection medications, no matter the price. And because Jesús lives in Venezuela, that price is often astronomical. This is the second of a three-part WLRN series, “Escape From Venezuela.” Read Part One. The country’s economic collapse, a catastrophic vise of depression and hyperinflation, has made anti-rejection meds like mycophenolate and cyclosporine all but non-existent there. So when they can be found, patients like Jesús usually head for pawn shops. His wife, Dr. María Eugenia de Mendoza, is a kidney specialist. (That’s how they met.) She’s seeing many Venezuelans in her husband’s situation today – and worse. 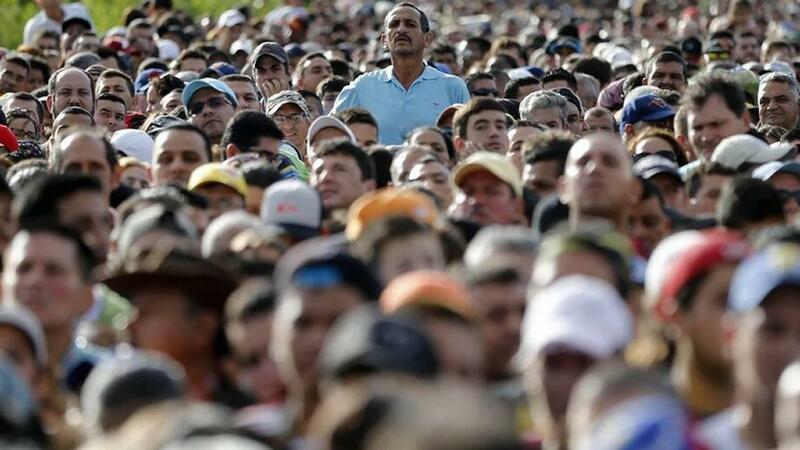 Venezuelan migrants and refugees waiting to cross the border into Colombia. The couple live near Venezuela’s western border, so they often cross over to Cúcuta, the Colombian city where thousands of Venezuelan migrants arrive each day escaping the crisis. Like Jesús, many of them come for the medicine and treatments they can no longer get in Venezuela. But even in Cúcuta, medicine can be exorbitant for Venezuelans and their worthless currency, the bolívar. That often leaves Jesús feeling “like a penniless kid with his face pressed up against a candy store window,” he says. But word about these so-called medical refugees in Cúcuta has gotten to South Florida – home to the U.S.’s largest Venezuelan community – and to expat non-profits like the Houston-based Cuatro Por Venezuela. At a warehouse near Miami International Airport, Cuatro Por Venezuela volunteers recently packed boxes of donated medicines – including anti-rejection meds for transplant patients – to be shipped covertly, as usual, into Venezuela. “We cannot help everybody, but the ones we're helping, the fact is many would be dead now without these medicines,” says Adelys Ferro, a Cuatro Por Venezuela coordinator. But Ferro was also making a pivot. For the first time, she was asking her secret couriers – the folks who know how to navigate Venezuelan customs – to steer some of the meds to Colombia. And to Jesús Mendoza. At a café in Cúcuta, he shows me the mycophenolate pills he recently received via Cuatro Por Venezuela. And he fights back tears. A Venezuelan expat volunteer in Miami with the non-profit foundation Cuatro Por Venezuela packs donated medicines to be shipped to Venezuela - and also Colombia. Those pills also represent a big shift in how the Venezuelan diaspora in South Florida is confronting the crisis. Many expats and expat charities are directing a portion of their aid shipments of food, clothes, medicine and toiletries to places outside Venezuela like Cúcuta – because that’s where so many Venezuelans are now headed. By the end of this year, an estimated 3 million of them – a tenth of the population – will have emigrated since 2015. Some 700,000 have settled in Colombia alone. Venezuelans now account for more U.S. asylum applications than people from any other country. And most of them blame one man: Venezuela’s authoritarian socialist president, Nicolás Maduro, who on Sunday claimed he’d won re-election in a vote much of the international community called fraudulent. Nuñez, who splits his time between Venezuela and Cúcuta, is referring to Maduro’s refusal to let international relief aid into Venezuela – largely because he denies there even is a crisis. Meanwhile, more and more of the aid expats send into Venezuela is getting confiscated by corrupt customs officials. As a result, Nuñez thinks a new aid paradigm is emerging. Nuñez’s aunt in Miami, for example, no longer wires money or ships packages to him and his mother in Venezuela, where an absurd exchange rate system all but decimates whatever funds arrive there. Cash, boxes – it all now goes straight to Cúcuta. 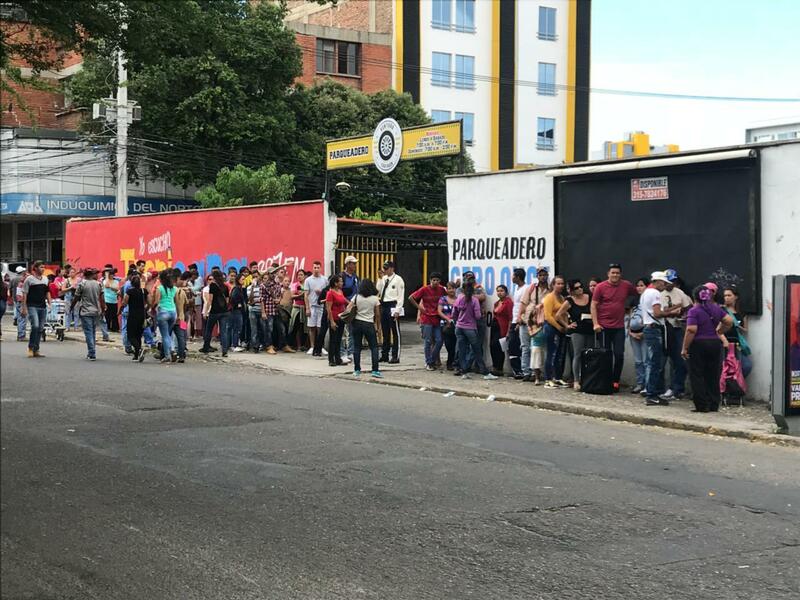 Venezuelan migrants and refugees line up for blocks at a Western Union office in downtown Cucuta, Colombia, to get cash wired by expat family and friends abroad. Even Venezuelans who haven’t fled their country often find it’s easier to get that aid smuggled over the border from Colombia instead of through Venezuelan ports and airports. Nuñez himself serves as a courier for friends in Caracas. That makes him part of a new system that angers the Maduro regime. And since it’s harder now for even college-educated, professional Venezuelans to get a visa to come to the U.S., more of them are heading to – or through – Colombia. Martínez, a computer engineer from Barquisimeto, Venezuela, was headed to Lima, Peru. But he’d told expat friends in the U.S. to send bus fare and aid to him in Cúcuta – a decision he realized was right when he crossed into Colombia that morning. To let him pass, he said, Venezuelan border guards shook him down for what little money he’d scraped together from his meager monthly wage. All this is creating demand among Venezuelan expats for shipping services to Colombia – like Rumbos Express in Miami, whose mostly Colombian customers have recommended it to Venezuelan friends. Venezuelan expat Lili Moros (left) with her expat husband Rafael Moros at their home in Miami. One of her new clients is Venezuelan expat Lili Moros – who now regularly sends help into Cúcuta for her sister in Venezuela. But Moros knows that even Venezuelan refugees in Colombia often have to choose between food and shelter. Her sister is a struggling pharmacist and single mother of five, and she’s about to move across the border to Cúcuta. So Moros has decided to subsidize their rent. Venezuelans Yecsy Teran and her son Jose taking a break from apartment-hunting in Santander Park in Cucuta, Colombia. The short anwer: it’s very hard. But for most, not as hard as life back in Venezuela. That’s why they’ll keep coming to Cúcuta – and why expat groups say they’re steering more of their relief aid to Colombia, Brazil and other refugee destinations. It's also why organ transplant patients like Jesús Mendoza hope the expat aid effort is embarrassing the Venezuelan regime, which has long refused to let in transplant medications from the Pan-American Health Organization. The regime finally gave the OK to distribute them in Venezuela this month. Next week, Part 3 of “Escape From Venezuela” will look at how the refugee tragedy for Venezuelans and Colombians has been reversed. Part 1: Exodus of the Desperate.